Is your content missing the mark? Today’s marketers spend a lot of time focused on creating well-written, compelling content– often at the expense of aligning that content to the goals and needs of prospective customers. For your content marketing to be truly impactful, you must deliver the right piece of content to the right person at the right time. This starts by aligning content creation and distribution to each of the three sales cycle phases: awareness, consideration and decision. This is the first in a three part series on how to create impactful content for each phase of the sales cycle. During the first phase of the sales cycle, “Awareness”, your prospective leads are experiencing a problem but they have not yet taken steps to address this issue. Some may realize they have a problem but assume the solution is too expensive or resource-intensive and thus are not actively looking to engage a solution provider. Others may not realize just how serious their problem is and thus feel no urgency to address it or understand the benefits in choosing to address it now rather than six months down the road. Finally, the prospective leads may not even be aware that a problem exists in the first place! Define the problem in terms favourable to your business. Doing so will uniquely position your company as the logical and preferred solution provider. This content defines a problem (e.g., low lead conversion rates) and then offers possible solutions that your company is best able to provide (e.g., no recent inbound marketing audit, inconsistent inbound linking structure, no alignment between landing page offer and PPC ads, etc.). Establish your company as an industry thought leader. It’s not enough to just define the problem-solution set in your favour. You also have to be sure that the lead is confident you’re a good solution provider! The lead may be unfamiliar with your company or have only limited brand exposure. Here at Frozen Lemon, our goal is to provide so much value that even if the lead doesn’t ultimately convert, we are looked at as a credible source of thought leadership and authority and when that lead is ready to purchase we’ll be one of the first to come to mind. Your content is out numbered and out read. The average B2B buyer will read three pieces of content about your company for every one piece of content your business publishes. This means for every blog article, white paper, eBook, email or case study your prospect reads, they’ve read three other pieces of information about your company. This isn’t necessarily a bad thing. The other content could be positive online reviews, an influencer’s blog post or a brand advocate’s social media endorsement. What this does mean, however, is that your ability to control the message is limited so every single piece of content you publish needs to be on point. You can’t wait for the evaluation phase to start making the case for your business! Today’s B2B and B2C customers follow a “self-serve” model. They’re used to actively seeking out information on their own and researching different solution providers before making a decision. Consequently, customers are at least two-thirds of the way through their decision-making process before they ever contact your firm. You can’t wait until leads contact your firm to start selling them on why you’re the ideal solution provider. You need to frame the buying vision in your favour as soon as possible– ideally before leads begin considering potential solution providers. The most impactful content for the Awareness phase will educate (e.g. white papers) and drive a change in the status quo (e.g., results-focused case studies). Educate leads. This is the first step in the awareness phase. These are the people who are not even aware that they have a problem. White papers and deeper dive content pieces are ideal for shifting this awareness status from “uneducated” to “educated”. Shift from status quo. The second step in the awareness phase is motivating leads to take action. Once they become aware there is a problem, they need to then be motivated to seek a solution. After all, educated leads that remain complacent aren’t going to convert! Shorter case studies with a heavy focus on the benefits of solving the problem (e.g., updating inbound traffic offers can increase lead generation by 101%) will help shift your leads for complacency to action. Takeaway: Use content to educate and shift the status quo. Sixty-five percent of vendors who create the buying vision also get the deal, reports Forrester Research. 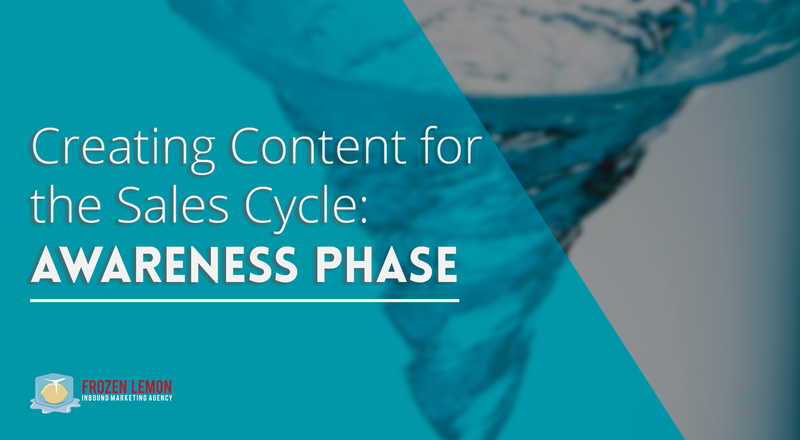 Aligning your content with the awareness phase will position your company for success as the preferred vendor from day one. You can’t wait for a lead to stumble upon your website. You need to be proactive in publishing and distributing content that frames the problem in your favour and establishes your company as an industry leader.